Four great products from ICAST 2015 that you will love! I just got back from Florida and have been playing around with some of the hot new stuff that was just released at ICAST and some of it is just plain nasty! Packs, storage, apparel, it’s hard to know where to start with it all! I’m sure you’ve already seen a lot of stuff, but here are some things I found that flew under the radar that are going to be big hits for 2015 and beyond! Hikers, photographers, anglers, hunters, and outdoor enthusiasts alike: meet your new best friend. 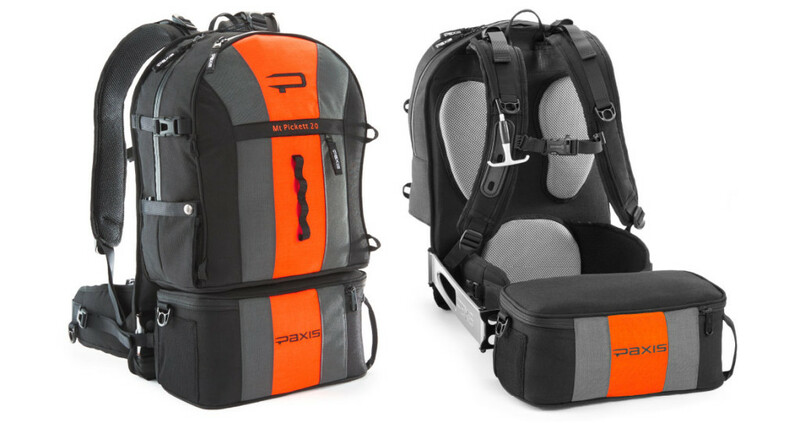 The incredible minds at Paxis Pax have created the most convenient piece of gear since the zipper! By simply pulling down on the handle, the bottom third of the pack is released so the wearer can swing it in front of them. Highly water-resistant with waterproof zippers, padded supports strategically placed for optimal comfort, hydration port, interior tablet pocket, tripod pocket, and much more! 5.5 lbs of awesomeness. I love that I can get new batteries or mounts for my GoPro efficiently without having to remove my back often while storing them in a safe place. Made by people who love the outdoors, for people who love the outdoors. The Mt Pickett 20 is 20x12x7, a slightly bigger version of the Mt Picket 18 (18x12x7) but each offer the same 5 pound storage in the shuttle pack, so really the 20 is just for people who are a little taller or need the extra room for additional gear. Extremely well made, comfortable, and what I love best about this product is that it fills a need! This is the first of two products that I’m going to show you from SP Gadgets that are going to help you with your POV experiences. This case solves a HUGE issue for me. Previously I had been using a 3500 box, but it’s not padded, and it takes up a LOT of room to store what I feel is a moderate amount of gear. This box is sleek, padded, has tons of storage, and holds everything I need to shoot a full day. You’ll find that the more you use this case, the more you like it. One of my favorite features is the fact that the padding is cut to fit a wide range of products, so it’s not going to limit people who only have particular gear. It comes in black, blue, or olive (my choice and great for hunters! ), and measures a perfect 330x220x68mm. I fit a TON of trinkets in this case and I know you will too! I’ve used a lot of mounts, and I’ve ever made some of my own that I needed because they simply weren’t available anywhere, and THIS mount right here is going to be one that I never leave home without. Comprised of two magnetic discs, the SP Flex will literally go anywhere you want it to you. Put the bottom piece under your shirt and you have an instant harness, use the velcro strap and you can attach to a tree or pole. It’s weatherproof, and the 4 magnets are insanely strong and allow you to attach the disc to any flat or curved metal surface. I’ve lost a camera because a mount failed, so I’m overly critical and this one passes the test. Use it with confidence. The Prime is the newest in a great line of outerwear from Stormr. This jacket pulls several key features from the Strykr and Typhoon, with a few new features of its’ own to round it out into something that anglers are gonna go crazy over! I personally think the newly designed cuff is my favorite upgrade, because it allows you have them rest loosely, but quickly tighten to provide waterproof support in a moment’s notice. Warm, comfortable, and a great design to compliment the movements of anglers so it won’t pull on you when you’re wearing it and doing what anglers do. It’s a great choice for days when it’s a little too cold for a Fusion, but not cold enough for a Strykr. Check out more pics and deeper reviews of each product over the upcoming weeks at http://www.JimRootFishing.com! Previous Previous post: Top Ten finish at the Inaugural ICAST Cup at Lake Toho! Next Next post: Cayuga Lake largemouth bass fishing with Elite Pro Seth Feider!